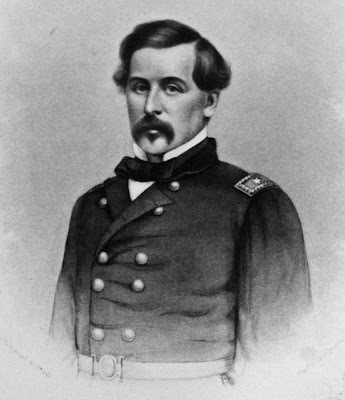 Gen. Thomas Francis Meagher had been sentenced to hang, exiled to a penal colony in Tasmania, and hunted jaguars in Central America before he ever made it to Fredericksburg. Once there, at age 37, he led the Irish Brigade's charge of the stone wall at Sunken Road during the 1862 Battle of Fredericksburg. The sword that Meagher (pronounced "Mahr") is said to have carried during that battle took a similarly circuitous route--though without quite so much drama--before arriving in Fredericksburg just a few days before the 147th anniversary of the battle. Meagher's sword will be on display for the next month at the Battlefield Visitor Center on Lafayette Boulevard.